One of Casey’s former caregivers, Tracy, recalls the first time Casey met his close friend Vicky. Vicky had been a pet chimpanzee before coming to Save the Chimps and loved any toys that had wheels. Our senior veterinarian had given her a full-sized children’s bicycle to play with on one of her first overnight visits with Casey. When Tracy returned the next morning, Casey was tinkering with the bicycle and had taken it apart almost entirely! Casey seemed very proud of himself for taking apart the bike handles, seat, and training wheels, and Vicky didn’t seem to mind at all. Throughout the years, Casey and Vicky found many adventures together and remained dear friends. We are deeply saddened to announce the passing of Casey, one of our oldest and most beloved residents at Save the Chimps. 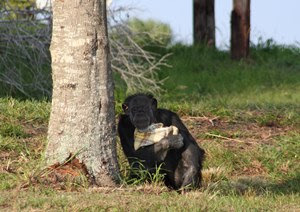 A member of Tanya’s group, Casey was highly respected by every chimpanzee in his family. 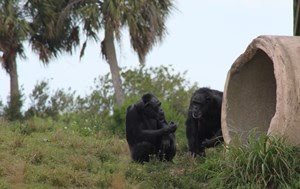 Casey loved being outside, and when he wasn’t playing or grooming with other chimps, he could usually be found relaxing with a blanket in his favorite spot – or as we called it, “Casey’s spot” – a quiet, grassy area surrounded by trees at the water’s edge of his island habitat. 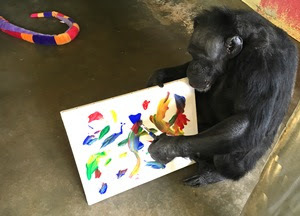 Casey was a remarkable chimpanzee who made the most of sanctuary life. When Casey arrived to the sanctuary, he was initially incorporated into Doug’s family, where he became alpha of the group. He was an excellent mediator during disputes between the chimpanzees, though admittedly he seemed to enjoy being a part of the drama at times! He became highly protective of the “old lady crew” of the group – Henrietta, Rebecca, and especially his dear friend Dana. Casey became close friends with Sonny and Pepsi, who became quite a trio to be reckoned with. Eventually, Casey was moved to Tanya’s family with some of his closest friends, including Rebecca and Sonny. Casey and Sonny remained thick as thieves throughout Casey’s life, and were often seen eating together and relaxing out on their island. Casey was full of adorable quirks and unique features. He had a small build, but was very muscular, leading to the affectionate nickname “Mr. Universe.” New caregivers quickly became familiar with rhythmic “Casey sounds” they would hear echoing throughout the indoor area. Casey would find a toy or cardboard box and happily tap it until someone joined him to play. Caregivers came to love these sounds, as they indicated Casey was nearby and happy. Sometimes he was so eager to play, he would refuse his food during mealtimes until he got a proper play session out of his caregiver first. Once he was satisfied that they had played enough, he would gently accept his food. Though Casey’s date of birth was estimated, he was more than 52 years old at the end of his life and believed to be our oldest male. His health began to decline as a result of old age, particularly due to cardiac disease. Two young females, Ellie Mae and Salina, became particularly close to Casey as his health began to decline. While they usually spend their time with younger males, they took excellent care of Casey at the end of his life. They would often wait for him to come inside before they would eat their own meals, especially Salina. She would look toward Casey’s tree on the island and quietly wait for him to approach. After Casey passed, Salina began to cry out and embraced Vicky, who was sitting next to her. Salina then found a stuffed animal and pushed it toward him. She seemed to feel adamant that Casey should have this token of her affection. We kept it with him until he was cremated for his ashes to be spread on his island home. Casey may have been of small stature, but he filled every moment to the brim with happiness and warmth. To know Casey was to know love. We were honored to know this love, and will always carry his memory with us. Rest in peace, Casey. We will miss you always. Join us in remembering him.